The definitive article on the battle that erupted between Family Guy and Sarah Palin has been written: it's an A1 NYT feature, it's comprehensive, and with any luck, finally puts this stupid, boring, predictable saga out of sight forever. In the event that you can't understand why a cartoon on Fox would be embroiled in a highly quotable media brouhaha with a former vice-presidential candidate, all you have to know is that it's Family Guy and Sarah Palin. But if you need more background, basically: Family Guy airs episode starring character with Down's Syndrome voiced by actress with Down's Syndrome. Vague allusion/"joke" is made about Sarah Palin as character with Down's Syndrome notes that her mother used to be the governor of Alaska, har har. Palin, who has child with Down's Syndrome, gets angry, gets on Facebook, and writes about how hurt she is, as former Vice-Presidential candidates are wont to do. "I guess former Governor Palin does not have a sense of humor." She added that in her family, "we think laughing is good," and that she was raised by her parents "to have a sense of humor and to live a normal life." Ms. Friedman continued, "My mother did not carry me around under her arm like a loaf of French bread the way former Governor Palin carries her son Trig around looking for sympathy and votes." Gail Williamson, executive director of the Down Syndrome Association of Los Angeles, which, among other services, assists films and television series in casting actors with the disability, and helped Ms. Friedman get hired by "Family Guy," said it did not matter whether she thought the episode was funny. 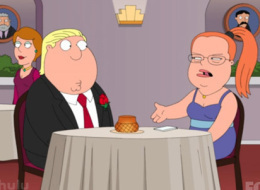 "Within ‘Family Guy,' the character was fully included, well-rounded, dynamic, not dealing with stereotypical Down syndrome issues," Ms. Williamson said. She added: "Am I a fan of that kind of humor? Eh. It's beside the point." Also correct! The ends here aren't necessarily bad. Someone got an acting gig, and someone pushed a unarguably "good" cause (equality) forward. There are worse results, and naturally, Friedman and Williamson are happy. Palin and MacFarlane, however, come out of this looking worse for the wear. Just for a moment, let's consider Seth MacFarlane telling the New York Times that he was proud of what he did, noting that the character's Down Syndrome being played as a secondary element was essentially the point. Seth MacFarlane's in the TV business, and he didn't do this to advocate a cause. There's an inherent shock factor in having a character with Down's Syndrome make a joke about Sarah Palin, who has a kid with Down's Syndrome. He took an audience by the eyeballs, and exploited a willing actress with Down's Syndrome to do it. And equality, indeed: What working, career actresses trying to make a living—Down's Syndrome or not—can you think of that would turn down a gig as high profile as Family Guy? None of 'em, and this one, like the rest, was more than willing to cash a paycheck. Can't blame her. On the other side, Sarah Palin has again and again fed into being baited by irreverent people making irreverent jokes at her family's expense. If you have a very large platform, and you say something that can even remotely be perceived as mildly controversial by Palin, it's pretty much a given that she's going to mic up and talk about this, as opposed to just writing guys like David Letterman and Seth MacFarlane off (just like the rest of the people they take on manage to do). She used the moment to step up on a platform and advocate a separate side of the same cause, but moreover, herself as a voice in "the conversation" about "the controversy." 1. Seth MacFarlane makes "controversial" episode of thing meant to entertain with Sarah Palin joke. 2. Sarah Palin joke elicits Sarah Palin reaction on internet and TV. 3. Sarah Palin reaction elicits Seth MacFarlane reaction. 4. Separate reactions of Sarah Palin and Seth McFarlane are yielded by "controversy," producing more "controversy." 5. More "controversy" yields NYT story. 6. Family Guy gets press, Sarah Palin gets soapbox, Fox gets viewers for Palin's argument on Fox News and for Family Guy's ratings, worthy cause gets talked about more. Everybody "wins." 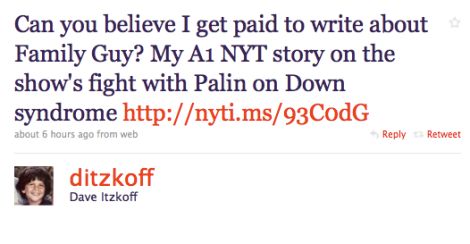 But mostly Dave Itzkoff, because he got more money than I did to write about this. Kind of related: if Robot Chicken made this joke, it'd (A) be funnier and (B) wouldn't be a story.